Steel with electrostatically applied light beige finish. Mounting brackets top and bottom. Knockouts - (4) bottom, (2) right side, (1) left side, (1) back. These safety transformers are specifically designed to operate in harsh environments, such as high humidity, combined with heat, and chemicals typically found around pools and spas. 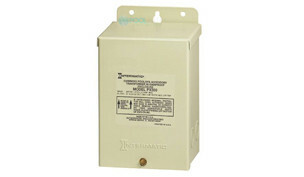 Transformer offers built-in circuit protection to disconnect power in case of defect or overload. The two piece enclosure is made from galvanized steel and electrostatically coated with powder paint in order to weather the elements. With cover removed, the high and low voltage compartments are fully exposed and the knock-outs make wiring extremely convenient. The transformer is made by the unique, two bobbin process and has a safety shield between the primary and secondary windings. In addition, the entire transformer is vacuum impregnated to resist moisture as well as for cooler, more efficient, and quieter operation. The output voltage of the secondary is selectable, depending on the input connections. All transformer models are safeguarded by an integral automatic-reset protector. Replacing 14 year old intermatics that have performed well. Because when you are going to install a low voltage light you need to transform 120V to 12V, this transformer does that. For my Low Voltage Light. Intermatic has been building xfmrs for a long time. The extra wattage will be used to power garden lights. Good price for 300W. We need it for our pool. if you are replacing two lights in a pool from 120v to 12v do you need a transformer for each light or can they both run off the same transformer? BEST ANSWER: Depends on how many watts are each light. The transformer is good for 300 watts so in theory you can put 30 x 10 watt lights or 2 x150 watt lights and anything in between as long as you don't go beyond 300.
how do I know if I need a 100 w or 300w transformer? I do not have the old one. BEST ANSWER: It will depend on how many watts is being drawn by the items you have running off the Transformer. 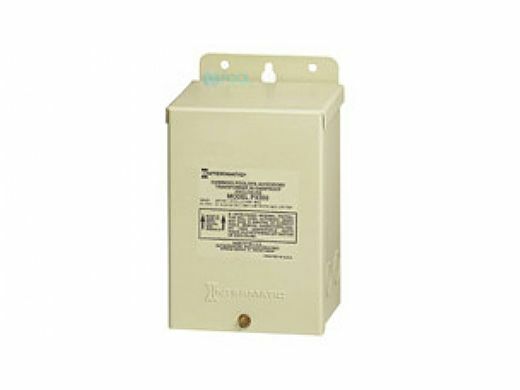 So if you're running landscape lighting and you have 5-50 watt bulbs you would need the 300 watt Transformer. Because the five bulbs equal 250 Watts. If you're using LED pool lights or LED landscape lighting then of course you'll maybe only need 100 watt Transformer. Add up all of the Watts of the items being powered. how far can transformer be from lights? I have installed one up to 200ft away and it is still working completely fine. Decided to switch to 12V pool lights and while talking to Rodolfo on tech support he recommended i got the 300W instead of the 100W for a very small difference, great customer service. How do I register for the warranty with my new Intermatic product? For Intermatic's warranty registration information, and to submit online, please click here. You can also access more information about Intermatic by visiting our manufacturer page.